Rogue Princes will be joining us for their first ever performance at the Festival this year. 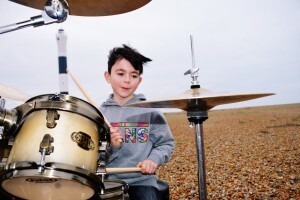 The main drive behind the band is their 10 year old drummer Rafferty who has taken to drums like a duck to water and is certainly one to watch. Surrounding himself with amazing, dedicated musicians and friends Rogue Princes have developed into a great covers band. 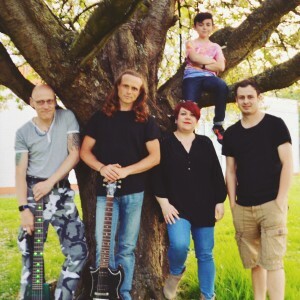 Although initially the band was put together to give Rafferty experience and confidence alongside other musicians, it has now become a small project for them all. Jack Kellam (Black Roses) plays lead guitar, and has developed a great musical relationship with Rafferty, on Rhythm Guitar they have Steve Campkin (Drummer Slam Cartel) who is also Rafferty’s drum teacher, so is an important part of the Rogue Princes development process. On Bass Guitar they have the ever energetic Brian Mills who has a back catalogue of experience and talent to boot! Finally on Lead Vocals is Sam (Rafferty’s Mum) who initially stepped in to support Rafferty, but actually enjoyed it and stayed on! This is your first year performing at the Festival….What are you looking forward to the most? I am looking forward to showing children my age that live music is better than being at home bored. So tell us a bit more about The Rogue Princes? It all started when I found my step-dad’s drum kit. I had a go, and I thought to myself ‘this is really fun’ so I decided to ask my Mum for drumming lessons, so we asked our friend Steve Campkin (Drummer for Slam Cartel and Rhythm Guitarist with Rogue Princes) to be my teacher. After a few lessons I was really enjoying it and Steve said I was very good, so my step-dad helped get some friends together for me to jam with to gain confidence and Rogue Princes was born. It is very important for children to get into live music or play an instrument because it can lead you into a life-long passion. Seeing Slam Cartel live and lots of other local bands with my family has made me interested in live music. Well if my step-dad did not have a drum kit, I would not be here doing this interview. My best friend Steve Campkin is my inspiration, I love watching him play and I bumped into Chris Slade once in Ashford and he was really nice about encouraging me and gave me good advice, which was if I did not have a drum kit to practice on saucepans like he did. I have really supportive family and friends who always help me. Yes, because concerts cost a lot of money and most local venues do not allow children, so the festival means children like me can see live music for free!